Book Reviews and Other Bookish Whims of Fancy. I think I am in love with Gail Carriger. Definitely an excess of soul! 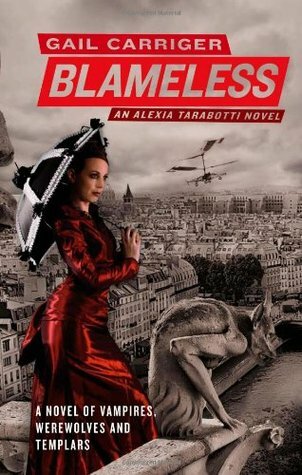 Blameless was the sixth book that I have read by Ms. Carriger, and as always, I found it absolutely divine! There are only two author's of whom I've read more: J.K. Rowling at seven books and Charles Dickens at eight, and they are both some prestigious company! When I read Ms. Carriger's books, I am always grinning, even going as far as to chuckle aloud, which rarely happens with many other books I read. Ms. Carriger's books just make me happy. There are many books that feel burdensome, like you are shackled to them while marathoning to the end. Those are books that I dread opening: I force myself to finish them because I know that the author put all of his/her passion into writing it, so I finish them out of respect for the author, but it's never fun. This NEVER happens while I read a book by Ms. Carriger. In fact it's the complete opposite. Her books call to me their siren songs, and I have to resist their magnetic pull in order to still appear responsible, but honestly I can't wait to get back to them. I fiend for them desperately. And when I finish reading them, I always have a big grin on my face and a swell of joy in my heart. I love reading the world she creates, which I like to believe is so true to Victorian life, yet just ever-so-slightly hyperbolized by the addition of supernatural elements. Sometimes, her world seems so vividly plausible that I actually have to wonder, "what if this really was the way Victoria or Elizabeth ruled, and history books just left out the supernatural elements?" And while many of the adventures are wildly outlandish, I want to believe so fervently that this was exactly how it must have been in those times because it's just so darn fun to imagine! I love her, ahem, the books! And there are still so many more left to read!!!!! I am three-quarters through the Finishing School series, and three-fifths through the Parasol Protectorate series, and I still have the novella about Alexia's father, and the Prudence series to go! And Ms. Carriger was even polling her fans for other characters who are spin-off-worthy, so I hope for more to come. And I will obsessively happily consume them ALL! I even read, and loved, her short story Fairy Debt, which was cupcaketastically fabulous - you must find the e-book version (it's only 10 pages long, so a VERY QUICK read, but still full of Ms. Carriger's whimsical perfection). So while this review is not specifically about Blameless, which is, by the way, gloriously cram-packed with adventurous French and Italian rendezvous involving Ladybugs, Vampires, and Templars (oh my! ), I cannot recommend this series enough! Honestly, if you are not reading Gail Carriger, you are severely deprived of the most amazing witty banter I have ever read. Her writing is superb! And Lord Maccon.....purrrrrrrrr! He is downright delectable! That's it! Stop whatever you are doing right now, and go out and get yourself a copy of one of her series. Now! No, really! Stop reading this instantly, and go read this series instead - you won't regret it!